We have a heart-wrenching and very critical case in the hospital right now. Charlie is a one-year-old miniature pinscher that was caught in an apartment fire early Sunday morning. He and his owner awoke to a smoke-filled apartment after their stove exploded. Though it was difficult for her to breathe, Charlie’s owner saved her dog and herself by kicking out the air-conditioning window unit and jumping three stories to the ground--with Charlie in her arms. DC Animal Control brought Charlie to Friendship for emergency care. When we first examined him, he was having difficulty breathing and could not open his eyes. Chest X-rays revealed severe damage from smoke inhalation. In addition, Charlie’s corneas were damaged by heat and exposure to smoke. We placed him in an oxygen tent and started aggressive supportive care. Meanwhile, emergency medics rushed Charlie’s owner to a nearby human hospital, where she was placed in an induced coma so doctors could address her multiple pelvic fractures. Not surprisingly, her lungs severely damaged from smoke inhalation. Here at Friendship, we are all in awe of how this heroic woman saved her dog. When we learned that she had recently been laid off from her job, and that she would not be able to afford Charlie’s extensive veterinary bills, we found a way to help: We turned to Friendship’s Brudder Sullivan Fund, which will now cover the cost for the majority of Charlie’s care. Earlier this week, Charlie seemed to be improving: he was alert, responsive, and breathing more comfortably. On Wednesday morning, however, he took a drastic turn for the worse, developing blindness and seizures. These symptoms are consistent with Delayed Neurologic Sequela, a term used in human medicine for a condition that has been seen to occur 3 to 200 days after severe smoke inhalation. Human doctors do not know if it is caused by lack of oxygen to the brain, carbon monoxide or cyanide toxicity. Prognosis for recovery is 50/50. We are doing our best but all we can do now is hope that Charlie will pull through this. He is receiving constant, 24-hour care from Friendship’s amazing technicians and his doctor - Hannah Minch - has been at his side constantly. As of Thursday morning he ate for the first time since the accident, which is promising. He is receiving medications to control his seizures as well as pain medication, antibiotics, fluid, and oxygen therapy. 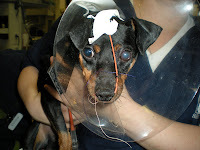 Charlie is a brave little dog in very serious condition. I will be posting daily updates on his progress, so please check the page often.